Split is the second largest city in Croatia and the capital of the Dalmatian Coast. Discovering Split was quite a revelation. It’s a remarkable city with a vibrant life, a rich history and a very welcoming atmosphere. A typical Mediterranean town with an idyllic seaside promenade, swaying palm trees and a colorful harbor. Aside from the unsophisticated urban neighborhoods built during communism, Split managed to preserve its historical aspect quite well. But what fascinated me about this city wasn’t just its rich history or beautiful location, near the deep blue waters of the Adriatic. 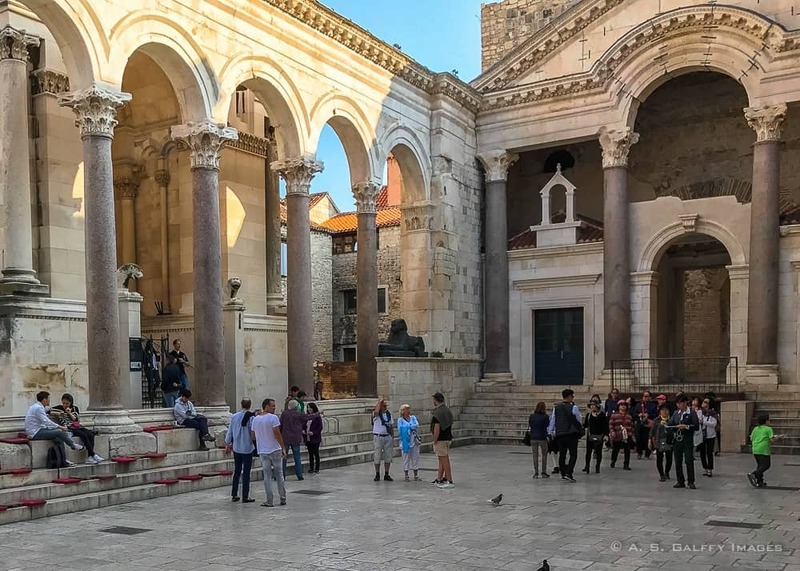 Split was built on the remains of a 4th-century fortress – Emperor Diocletian’s Palace – whose massive walls surround a mesh of Roman ruins, hotels, apartments, shops, cafés and restaurants, and even an ancient cathedral. Observing the dynamic life that has been happening within these ancient walls for almost 1700 years is simply amazing! No one visiting Split can avoid seeing the Riva. 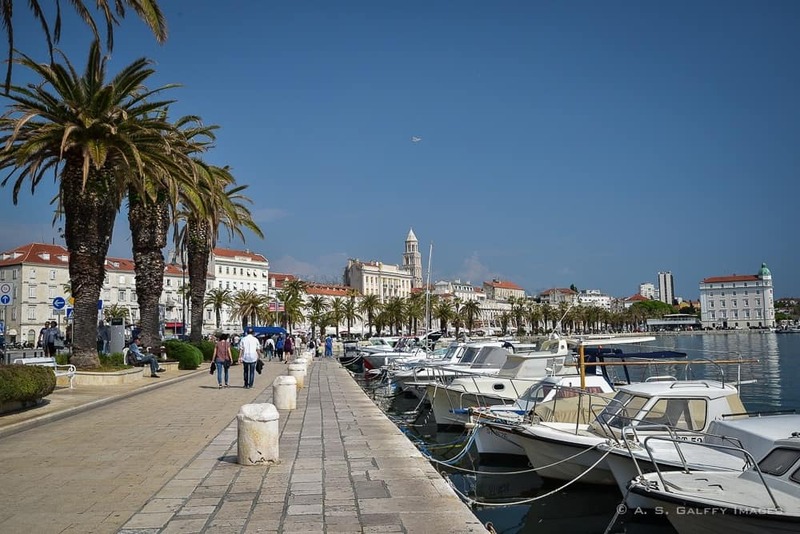 There is an energetic and spirited pulse on Split’s waterfront. There is always action on the Riva: boats fill its lovely harbor, tourists crowd its shaded cafés, stalls with local crafts and souvenirs line up its shores. Riva is a popular gathering spot both during the day and after dark. It’s the place for meeting, walking, hosting public events and enjoying the sea. 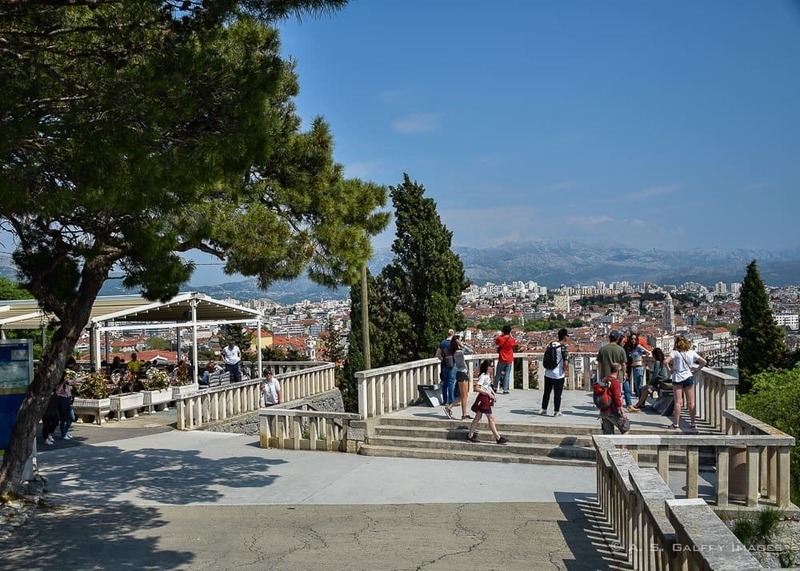 It’s no doubt the most popular and most important public place in Split. The Old Town’s most important landmark is Diocletian’s Palace and the Peristyle (the central square of the palace). 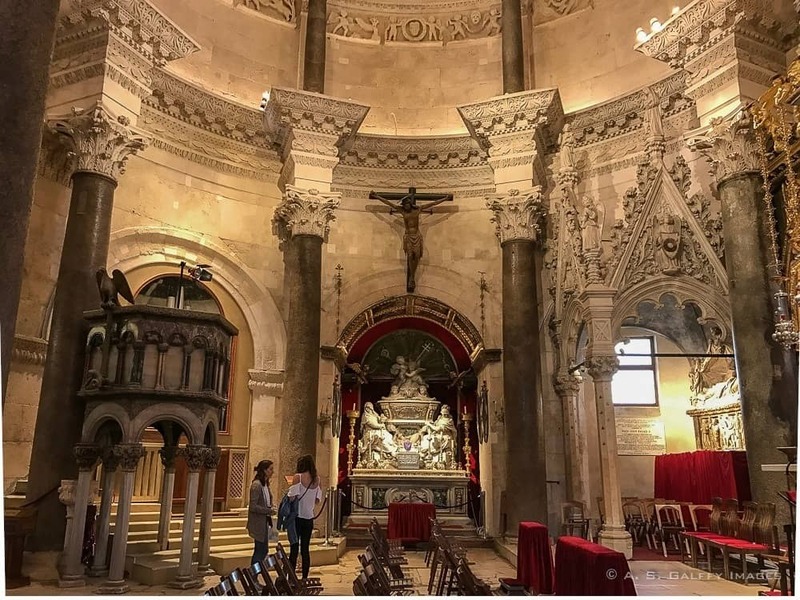 What becomes immediately clear is that Diocletian’s Palace is not a museum, but rather a walled village populated with hotels, shops, cafés and restaurants. Aside from Diocletian’s Palace and some other landmarks that you can’t miss when visiting the Old Town area (like Diocletian’s Mausoleum which is today Saint Domnius Cathedral, the Bell Tower, the Temple of Jupiter) it’s amazing to discover that many of the ordinary buildings within these walls are actually as old and beautiful as the palace itself. Few things are as excting as stumbling upon a sight that very few people seem to know about. 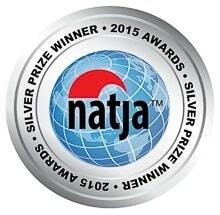 Unknowingly and through a fortunate accident, we happened to reserve a room at Split’s oldest hotel – Hotel Slavija. The hotel is located in the southern area of Diocletian’s Palace, above the part where the spas were. You can still see parts of the ancient walls in several places today. 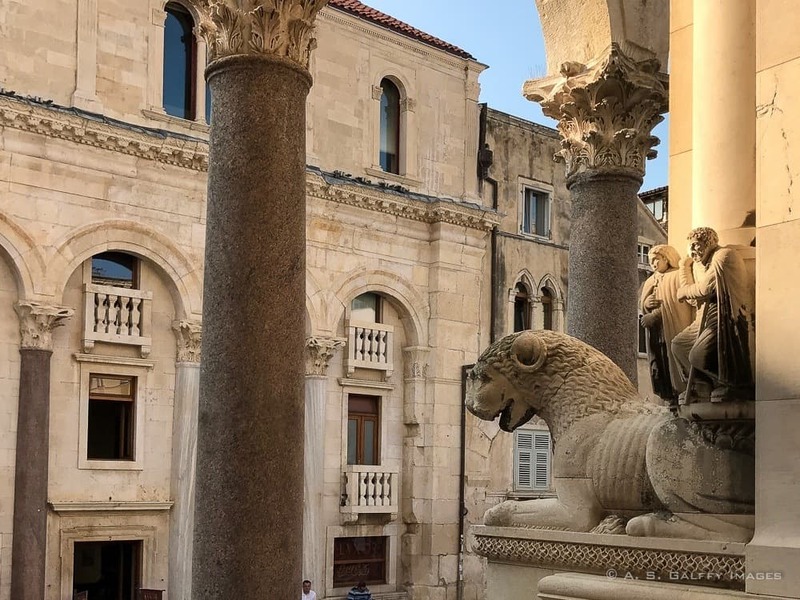 In more recent history, the building of the hotel can be traced back to the 16th century, when a Renaissance-Baroque palace complex was erected above the 4th century spas of Diocletian. A history buff and an excellent local guide, our hotel manager Mirjana gave us a lot of useful information about some of Split’s less known attractions. This is how we ended up visiting the Fortress of Klis, Marjan Hill and its surrounding area. Until you climb up Marjan Hill you don’t realize how big Split really is. The people of Split are very proud of their forest-park and for a good reason. They nicknamed it the “lungs of Split” because of its pine-forest fresh air. This verdant peninsula covered in dense vegetation, offers some of the most spectacular views of the harbor and the old town. 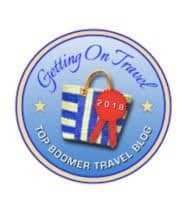 There are lots of hiking trails, and some very nice restaurants. During the hot summer months, this is a great escape from the city’s bustling life. 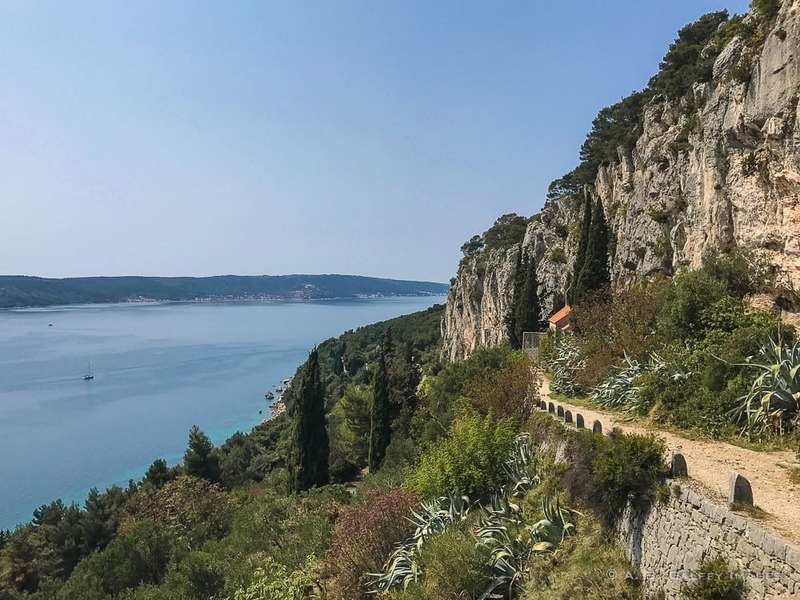 The fastest route to Marjan Hill is a 1.5 hours hike from the Riva waterfront via a stepped stairway. However, climbing up some 300+ steps is very tiring. We took the advice of our hotel manager, Mirjana, and hired a local guide from www.All4Split.com who drove us to the very top of the hill in his golf cart. From there we walked down a scenic path to the lookout point at Telegrin, stopping on the way to visit the Hermitage Caves above St.Jerome Church and St. Nicholas Church. There is also a bus that takes you half way to the top of Marjan Hill. However, you’ll have to walk the rest of the way if you want to see the Hermitage Caves. The advantage of hiring a local guide is that they get access to a private road on which they can drive you all the way to the top. That will you some blisters and a lot of sweat. It pays off to know a local! 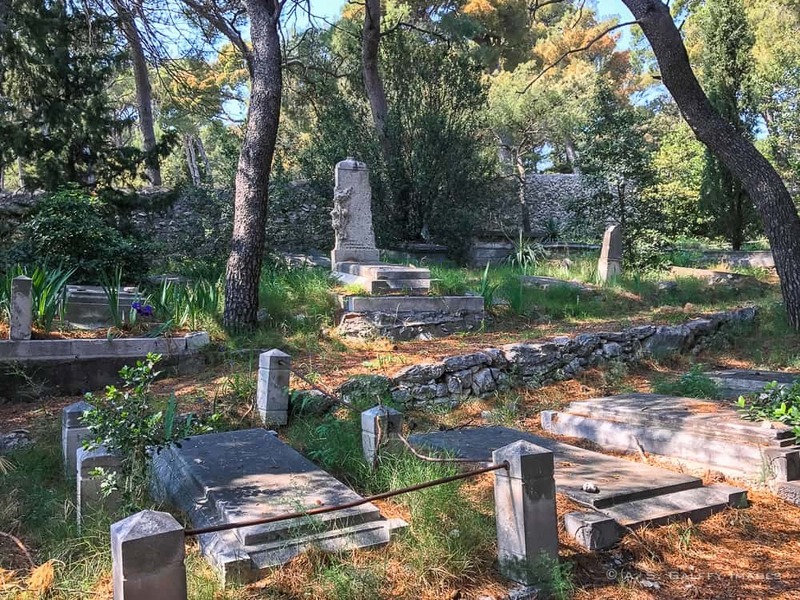 Also on the slopes of the Marjan Hill, you’ll find the oldest Jewish Cemetery in Split. The cemetery is next to popular Café Vidilica, a former funeral home that still has inscribed above the door a Jewish prayer. The cemetery is usually open but if locked ask at Vidilica for the key. The cemetery was established in 1573 and has about 700 graves. Some of the graves go as far back as to the 16th century. The rest of the graves are from the 18th to the 20th century. The last burial took place in 1945 when when the cemetery was closed and declared a monument. 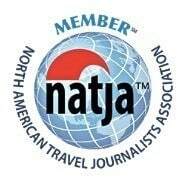 Split is one of Croatia’s most thought after destinations and a great place for family vacations. 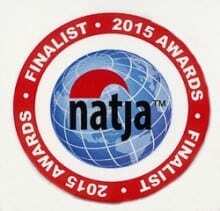 There is a wide range of accommodations in Split to fit every budget and traveling style. You should be planning to spend at least 2-3 days in this picturesque sea-side town. Thank you Victoria. I think Croatia is right up your alley. Oh I feel as though I need to go back to Split. We never climbed the hill, those views are wonderful. The photos are just amazing! Just looking at them makes me want to reconsider my next destination! I saw so little of Split outside of the few hours I wandered the Palace ruins. One day I'll return and in off-season when the crowds are less. How wonderful you stayed inside the ruins. Thanks for the mini-trip back to Split! It looks as if it is even more beautiful and lively than when we visited a dozen years ago or more (when it was just starting to recover from the war). Even then it was one of my favorite stops on our cruise through the Adriatic - the fact that people were living in all that history was amazing, but it also just felt comfortable. Now you have me thinking I need to make a return trip! A trip back to Croatia is always fun, Cindy. I'm sure you'd discover new places you didn't have time to explore the first time around. I just loved the diocletians palace, as you're exactly ín it in Split. Would love to go back! We definitely want to go to Split. I'm saving this post for later with all it's good information. Thanks!! I hear you, Jessica, I can only imagine how cold summers must be in Scotland. I have read many articles about Split but I do not remember reading about the fortress or view. That is why I love to get recommendations from locals. I like the idea of the private guide. I like views but I do not like going up (and less when you have to do it almost day during a trip). Had enough of that last May in Germany. Marjan Hill is not a fortress, it's actually more like a park. The "green space" of Split. 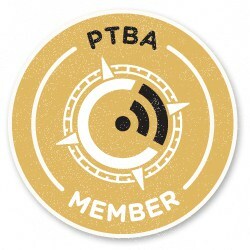 I am not usually using the services of local guides, but I had a couple of very good experience when I did it, so most likely I should do it more often. Split looks just stunning and your photos are gorgeous as always. We were in Split only for a day during our cruise a few weeks ago. It was one of those cities that we definitely put on our places to return to for a land vacation. We loved the area and despite it being so darn hot during our visit. we did a tour that covered Diocletian's Palace and a ride along the coast. I wish we had more time to visit Marjan Hill. Beautiful photos as always. In one day you can cover basically just the Old Town area, but not the surroundings. You definitely should return to Split, Mary and if you do remember to visit Kliss Fortress as well. It's just a few miles away from Split. Love the pictures of the Riva waterfront, Anda! It looks almost tropical with the palm trees. The Hermitage Caves look intriguing as well. They look impossible to reach! Hence the name, I guess. And wow, I can't imagine how cool it must have been to stay inside a 1,700-year-old compound! Do you know how old the hotel itself is? The building itself goes back to the 16th century, but it became a hotel at the beginning of the 20th century only. I think of Dubrovnik whenever someone says Croatia, but Split looks amazing too. Great photos. I love the one with all the boats parked in a row. 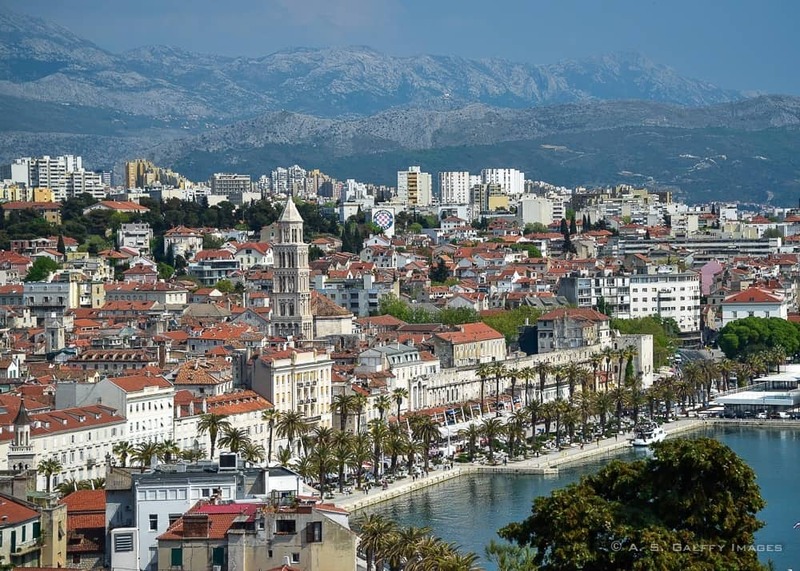 We wanted to visit Split even before reading this. But wow - now we want to go even more! Just that first picture sells us. It looks just like the sort of place we love exploring. Toss in the history and Roman influences, the beautiful historic center, and those amazing views...forget visiting, we could move there! (Our list of potential new home towns is starting to get long... ;) So glad you shared this gem with us! Your pictures are beautiful!! Our day was soo incredibly hot, I didn't take very good pictures because I just wanted to get in the water haha - looks like we defintely missed a great look out point! Will have to make note of that one!! I've heard Croatia may get very hot in summer, Lolo. I'm glad I didn't have to experience that heat myself though. 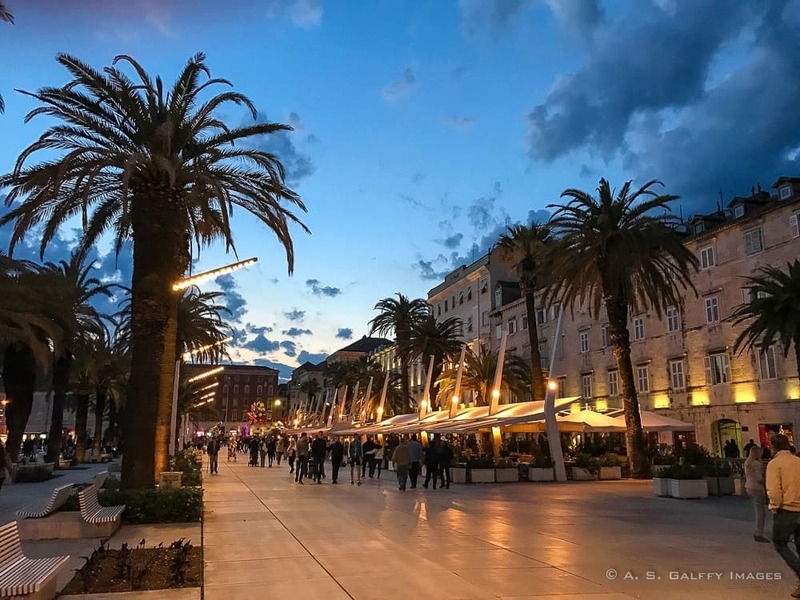 Split looks so beautiful (great pictures Anda!) and looks like there is lots to see. It will definitely be on my itinerary when I make it to Croatia. Thanks, Agnes. Split is not far from you, I guess you can go anytime. 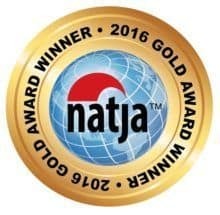 You did well by staying at Hotel Slavija and taking their advice of using a private guide. I find that private guides save time and disappointment by making your touring more efficient and avoiding missing significant places. I agree, Rhonda. The locals always know more than you can possibly find out by doing your own research. Besides, they always have some connections that may come in handy sometimes.